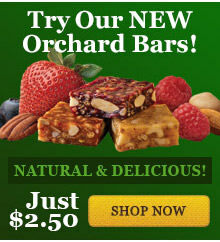 - Try New Orchard Bars for just $2.50 and Free Shipping! 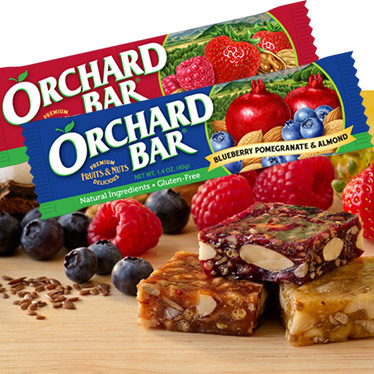 Home > > Try New Orchard Bars for just $2.50 and Free Shipping! Try New Orchard Bars for just $2.50 and Free Shipping! New Orchard Bars from Liberty Orchards are energy and nutrition bars made from fruits, nuts, seeds, and soy nuggets that actually TASTE GOOD! For just $2.50, we'll send you two bars; Blueberry Pomegranate & Almond and Strawberry Raspberry & Walnut. Normally, we'd charge you extra to cover the shipping & handling, but we think you'll love them enough to buy them again, so the shipping is on us! Just click ADD TO CART, give us your name, address, and payment information, and we'll send your samples right away via USPS First Class Mail (allow 1-3 weeks for delivery). Coupons not valid with this item. These are the best fruit and nut bars by far. THESE BARS ARE REALLY GREAT.. THEY ARE TRULY NATURAL AND DELICIOUS.. A TASTY TREAT!! Strawberry Raspberry one is great! I came across these at Winco foods, looking for healthy nutrition in bar. Unlike most brands of nutrition bars full of false advertising, if you get my drift, these are made with real organic fruits, nuts and seeds. I love that!... I hope I can continue to find these at Winco, but if not, it's nice to know I can shop online to get them. I've tried so many 'health' bars and none of them had the wonderful ingredients that Orchard Bars have. I have one every morning. Chocked full of nuts, fruit and flavor! I bought the bar on a whim as they were by the salad bar. It sounded good but in the past, what sounded good didn't taste to good. I bought the strawberry raspberry walnut bar and it was absolutely delicious. Just enough sweet to satisfy my sweet tooth. I will definitely buy them again. My husband grabbed these from a gas station in San Diego shortly after we moved to the area. I have NEVER had a better bar and I have been scouring the different stores I visit to find them! I am hoping you will start selling to Costco so I can buy boxes of the Strawberry Raspberry and Walnut bars!!! Thank you for an excellent product and please, PLEASE expand your selling base! I just love the Orchard Bar, it's just so sad they are not sold in the Tri-Cities on a regular bases. After 2 years of searching I found them at Winco, when the supply was gone I never saw them again! I recently bought your Cherry Almond Crunch 'Orchard Bar', when I was in the Seattle airport, looking to buy a gluten-free, nutritious,tasty bar that I could take on the plane with me. The bar is fantastic! I kept the wrapper, searched stores in Santa Fe, finally decided to search the Internet, and voila! I found you! I'm ordering several products today! These bars are awesome! I have always liked your products and this one is your best creation so far and especially good because they are a healthy alternative and contain vitamins, fruits and nuts! AND they taste fabulous! My sister and I stopped at a little store on the way to Reno, Nev. and bought these. They were the best we've ever had but haven't been able to find them anywhere since. Normally, I don't write food reviews, especially on company sites, but...after I bought one of your bars, I was hooked, just like the rest of your loyal fans. The taste and natural flavors are amazing, and I wish that you had them in more locations. working night shift this is a great snack to give you energy to get you through till morning. These are delicious and have alot of substance to them. Yes...Love the Orchard bars. I came on this site to see where I could buy them in bulk! So where can I? Liberty Orchards Reply: We don't pack them for "bulk" sales. They are only available in wrapped-bar form, and the full line is available at this website. If you are a retailer or wholesaler, call us 509-782-2191 for volume pricing. As Tony The Tiger would say..."They'r-r-r-re GREAT-T-T-T! I saw a display at my college bookstore and tried one then another, now I am Hooked! I already really like the fruit and nut candy, which I found in Hawaii in the 80's, but now I'm lovin' the Orchard bars...ummm...ummm and Oh-o-o-o- Yeah! Beats ALL other bars, hands down! On a recent cycling event I had my first Orchard Bar offered by the rest stop volunteers. It was SO good that I asked at every stop if anyone knew where they had been purcased. No one did, so I saved my wrapper and looked up the "where to buy" when I got home. Can't wait to go buy an entire box! Best EVER! I am totally obsessed with these bars. I eat at least one everyday. I buy them by the carton. When the Bi-Mart starts to run low, I start to nag them. I've tried many nutrition bars, but very few have ever reached obsession level. They are so yummy and healthy. Please keep making them forever! Delicious! The best bar I've had! The coconut pineapple is so good. This is the best bar I've had. You can really taste the fruit very well, it's delicious! I was really impressed! Hands down the Best ! A must Try ? This Bar is Like No other 1st of All It is Addicting with Exotic Flavors ! Reminds me of The Wonderful Flavors of the Tropics !Job Well Done Liberty! Press on ....sold @ my Local Vons only ! Highly reccommend I buy the whole box now when its in stock! I share this unique snack with others whom are missing out on this Heavenly Treat . I saw an ad in Safeway's grocery paper showing these Orchard Bars on sale....so I thought I would give one a try. I picked the Pineapple Coconut and Macadamia....and what a great pick that was. As soon as we got in the car I had to peal the paper away to try... and I was not disappointed. The sweet pineapple and crunch of the macadamias blended perfectly on my tongue....and the only sad moment was when I had eaten the entire bar. I tried to chew as slowly and as long as possible... loving every juicy bite.. .. but all moments eventually have to come to an end... well until the next beginning. I look forward to a life long relationship with Orchard Bars....better than a candy bar! My husband and I both find Orchard Bars absolutely delicious...probably the best snack bars EVER and without question the best healthy option we've ever tasted. No more granola bars, fiber bars, etc. for us! So far, the only place in San Diego we have seen them is at Vons. Hoping to find more stores carry this tasty treat! I bought these as an alternative to my usual Larabar at the airport before boarding a flight home. They were delicious and hit the spot when I got hungry in the middle of the flight. I look forward to finding them locallly. I was completely taken by suprise at the taste after reading the simple/ natural ingrediants. I love snacking on them through out the day. Cashmere definitely has the BEST BARS IN TOWN...ORCHARD BARS are like no other! An excellent "pick me up" when I have left the house without breakfast! THANK YOU LIBERTY ORCHARDS!